When I wrote about watching the Higgs discovery, I chided scientists on Twitter for over-reaching regarding what was being said and lauded science journalists for showing some moderation, but that does not mean all journalists could resist being silly. And it doesn't mean all scientists were over-reaching. Italian particle physicist and ATLAS experiment chief Fabiola Gianotti, for example, was doing the opposite and wrote just two weeks ago in an email to the New York Times, "Please do not believe the blogs" because Dr. Peter Woit had info that they were going to release results showing a 4-sigma signal. Then on July 4th she slapped up a slide with 5-sigma on it instead. Technically, she was right - the 4-sigma was wrong - but in spirit she was engaged in some attention-getting gamesmanship. Journalists and media companies do the same thing. You can read Ian Sample at The Guardian or Dennis Overbye at The New York Times, for example, and get a little smarter, and then read some other people and feel like you have been lobotomized, but the crazy headlines got more attention. I am going to talk about those crazy people. Yes, the Higgs boson was going to give us faster-than-light travel. What was their source for that? None that I could find, actually. Nowhere in the article does any scientist actually claim that. Instead, in the comments we have their audience speculating that if the Higgs gives the universe mass, then we might be able to "un-mass" ourselves and travel from place to place at faster than light speeds. 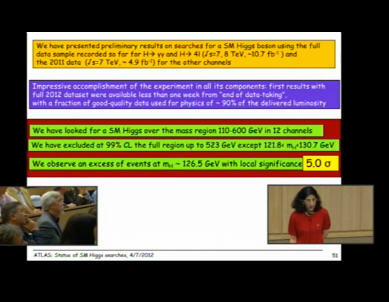 And one person talking about ways they might weaponize the Higgs. So maybe it's an instance where a media company solicited crazy comments first and then built the headline on those. I certainly can't find any way that the Higgs is going to let me spend a weekend at Alpha Centauri. The BBC doesn't seem to realize that the "God particle" does not actually have anything to do with God. Finding the Higgs does not in any way debunk religion unless you are some militant atheist kook who finds some way to make everything as debunking religion. They put it in quotes, which is a mainstream media editor's way of saying 'we are not saying this, we just went out of our way to find someone to say it so we could put it in a headline'. I guess they were short of miracle vegetable stories this week so they had to go after religion. Okay, it may seem like bullying to ridicule MSNBC but they take Science 2.0 fave Lawrence Krauss' scientifically broad idea of what is possible and get silly with it. "It's possible if you were able to heat up some region to something like a billion, billion, billion degrees, then in that region, the Higgs field would probably go away," Krauss said. Which is true. Along with all of the matter you want to teleport. But it gave them a goofy headline that probably attracted the Nibiru crowd, since now they have a way to get their planet on our doorstep without it being detected. In even simpler terms, Higgs boson explains how stars, planets and even life was created and solidifies the Big Bang Theory. Without this particle, many physicists believed that the Universe could not exist. It matches the importance of the theory of evolution for biologists. I was at the World Science Festival in 2009 and the funniest thing I watched was Dr. James Watson, co-discoverer of the DNA double helix, say to String Theorist Professor Brian Greene (and founder of the World Science Festival and terrific science communicator) "Biology doesn't need string theory. Evolution works." So, no, the theory behind the Higgs does not actually have the same importance as evolution. The Higgs was created to fill a hole in the Standard Model and the Standard Model doesn't explain gravity. You can't really have physics without gravity. Did I miss anything even crazier? Let me know in a comment.